This sorbet hued 3 strand necklace is crafted by entwining a strand each of white, pink and lavender oval freshwater pearls, and is fastened with a sterling silver tube clasp. This triple strand necklace is crafted by entwining a strand each of white, pink and lavender oval freshwater pearls, lending it a sorbet shade, and is fastened with a sterling silver tube clasp. It measures approximately 21-22 inches depending on how tightly twisted, and would make an ideal wedding accessory or a statement on any occasion. 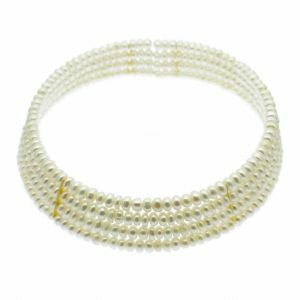 Your necklace will be dispatched to you in a quality pearl folder, suitable for gifting. 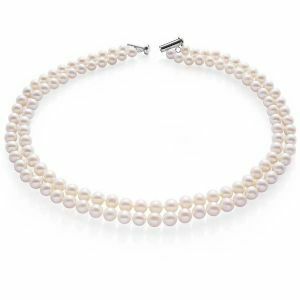 Classic double strand pearl choker necklace, in a choice of 2 lengths, featuring round high quality cultured freshwater pearls. secured by an easy to fasten sterling silver tube clasp. Fashionable four strand pearl collar / choker, featuring quality white high lustre cultured freshwater button pearls.